Shrines are places of worship. They are found in many areas of the world. They are the places where religious worship and festivals take place. In Japan, they belong to the Shinto religion. In Japan, the term SHRINE is used for Shinto Shrines and not for Buddhist temples.
. betsuguu,　betsugū 別宮　Betsugu, "detached shrine", separate shrine　- bessha　別社 .
. 外宮 Geku and 内宮 Naiku at Ise Shrine 伊勢神宮 .
. gokoku jinja 護国神社 Gokoku shrine for the protection of the nation.
. honsha 本社　- honguu 本宮 main shrine, central shrine .
. Ichi no Miya, Ichinomiya 一ノ宮、一の宮、一之宮 Ichi no Miya "first shrines" . - - - - - sooja 総社　Soja shrines、"combined shrines"
bunshi　分祀 - 分祠, bunsha　分社 "branch shrine"
niimiya, shinguu 新宮　"new shrine"
. kanpeisha 官幣社 imperial shrines .
. miya, guu 宮 shrine .
. Okumiya 奥宮, okusha 奥社　remote shrine, uppermost shrine .
. onsha, misha, gosha 御社 "venerable shrine" mi-yashiro, on-yashiro .
. taisha 大社 big shrines .
. yashiro, sha 社 small shrine, furu yashiro 古社 old shrine . Check for technical terms, glossary and shrine names in the ABC index on the right side. - - - . Shrines - Latest Additions .
. Japan Shinto Shrines - Facebook . This section deals with terminology relating to the religious institution of the Shinto jinja, customarily translated as "shrine," including its architectural structures and other facilities, ritual implements, and clerical vestments. Permanent shrine facilities were virtually non-existent in the ancient period, and while some examples of sacred spaces referred to as iwakura and iwasaka can be found, most occasions of ritual worship were observed at temporary sites. Present-day shrines are ordinarily composed of main shrine buildings (shaden) together with halls of sacred dance (kaguraden), shrine offices (shamusho), and other elements of the shrine precincts (keidai). Along the approachway inside the shrine such items as torii (sacred arches or gateways), Komainu ("Korean Lions"), votive lanterns (tōrō), and purification fonts (temizuya) can be found. Shrine buildings may include distinct structures such as a sanctuary (honden), oratory (haiden), and hall of offerings (heiden). The symbolic "kami body" (shintai) is usually sequestered inside the remote recesses of the sanctuary. Shintai may include mirrors (kagami), swords, jewels or any of many other items. Following the introduction of Buddhism and its influence, shintai came to include graphic images of kami (shinzō) and the esoteric paintings known as mandara. Natural objects are also occasionally found as shintai; when a mountain is viewed in this role, it is called a shintaizan ("kami-body-mountain"). 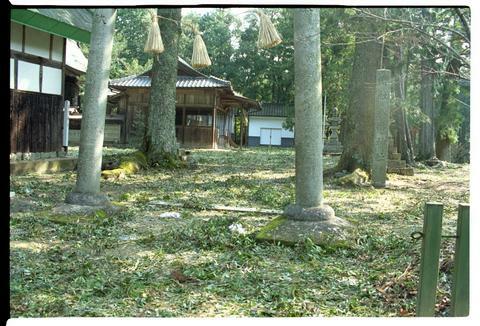 Aside from the shintai proper, other objects within the shrine precincts may also be viewed as sacred, including "sacred trees," (shinboku or shinju), which are frequently viewed as yorishiro, namely, objects in which kami may lodge and manifest themselves. Some shrines possess large numbers of ritual and art objects with sacred significance (see shinpō). Most are related to the legendary origins of the respective shrine, and they include some items classified as National Treasures or Important Cultural Properties. It is not unusual to find multiple smaller shrines within the precincts of a single larger shrine. 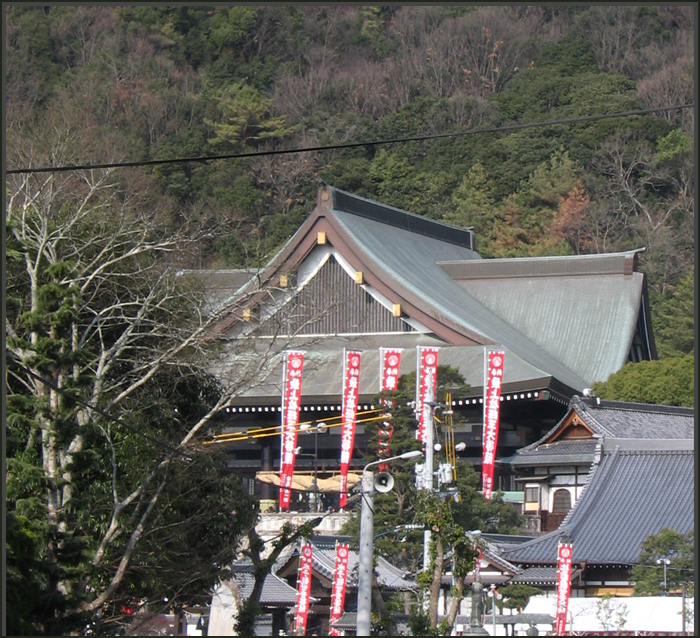 In addition to the main shrine, others may be subsidiaries called sessha, massha, or edayashiro. On occasion, a shrine complex may be composed of a dual set of shrines having the relation of a main shrine, located on the peak or high on a mountainside, to a facility located at the mountain's foot and provided for "remote worship" (yōhai). In such cases, the remote main shrine is called the yamamiya (mountain shrine) while the closer facility is the satomiya (village shrine). Shrines may include the following structures: honden or sanctuary where the kami are enshrined; heiden or hall of offerings, where offerings and norito (prayers) are presented; shinzenjo, the place where offerings for the kami are prepared; haiden or hall of worship, where seats may be provided for prayers and worship; kaguraden or hall of sacred dance, where kagura dance and music are performed. These structures may be surrounded by fences called mizugaki or tamagaki. Other facilities may include the temizuya or purification font, where worshippers purify heart and body with pure water; the shamusho or shrine offices, where priests conduct shrine business; the sanshūden used for various gatherings and assemblies; and torii, sacred taboo gates that demark sacred space. 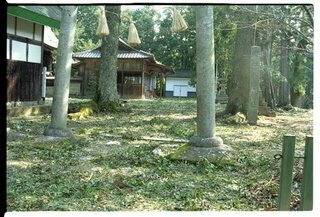 Moreover, many shrines are located in forests, where buildings and trees meld together for the preservation of function and landscape. With rare exceptions, the original form of shrines did not include physical buildings. Instead, on several occasions through the year, a himorogi (sakaki or other evergreen tree) or iwakura (a natural stone or boulder), was erected in a place considered to be sacred, such as at the foot of an imposing mountain overlooking the community, beside a clear stream, or in a forest, and the kami's presence was invoked there for the duration of the worship, after which it was sent off again. ... The etymology of the early word for shrine, yashiro 社 is thought to have meant a temporary structure (yashiro 屋代) erected for worship, in the same way that nawashiro meant a hut for raising seedlings, and an ajiro meant a spot for drying fishing nets. Festivals were generally held out of doors, but it is thought that a simple structure with a roof was eventually provided to protect the altar, and in time, shrine buildings came about as such roofed structures were left in place rather than being dismantled following the worship. Accordingly, the concept of the sacred also changed from one in which kami were thought to be visiting deities (raihōshin) that descended at set times each year, to one in which the kami resided permanently in the shrine as a tutelary of its parishioners. By contrast, another term denoting a shrine, miya 宮, is believed to derive from the honorific expression for a building (miya 御屋). Until the early Heian period, however, few shrines were permitted the status of miya, and of the 2,861 shrines listed in the Engishiki's "Register of Divinities," only eleven are included in this category.
. Goryo Jinja 御霊神社 Shrines in Japan .
. WKD : Umi no Sachi . The relation of Shinto to haiku is a vital one, but owing to the obscurity of the nature of Shinto it is difficult to write clearly on the subject. With Shinto and its boring and repulsive mythology, haiku has little to do, directly or indirectly, but primitive, or crude Shinto, which still persists throughout Japan, both expresses the national character and affects it. As far as it concerns haiku, there are two aspects of this Shinto which we must describe, animism and simplicity. Shinto, with its belief in the many 'kami' or minor deities of mountains, streams and trees, is a religion of nature worship. This fact is reflected in the large part played by nature in Japanese haiku. More technical terms on the right side of this BLOG!
. Shrines, Amulets and Talismans . “The number of Shinto shrines in Japan has changed over centuries due to various political and social changes. There were about 190,000 shrines during the early Meiji Era (1867-1912), before a drastic change came about in the merging of shrines and temples. The number of shrines was greatly reduced, and now there are only around 80,000. This is how Tsunekiyo Tanaka, president of Jinja Honcho (Association of Shinto Shrines) began a lecture — with a little humor. Established after World War II, Jinja Honcho was created to supervise Shinto shrines throughout in Japan, and Tanaka was speaking at a recent special public event hosted by “The Grand Exhibition of Sacred Treasures from Shinto Shrines” at the Tokyo National Museum. The exhibition celebrates the 62nd “grand relocation” of the Ise Grand Shrine and is being held with special assistance from Jinja Honcho and with the cooperation of numerous individual shrines throughout Japan.
. - Shrines visited by Matsuo Basho 松尾芭蕉 - .
. - Shrines visited by Masaoka Shiki 正岡子規 - . ***** . Ryuu Jinja 龍神社 Ryu Jinja "Dragon Shrine" . ***** . shinboku 神木, shinju　神樹　sacred tree, divine tree . a book and long list covering a lot of vobabulary ! From ancient times, the Japanese people have respected nature and appreciated its power that transcends human knowledge. People believed that gods resided in natural creations such as mountains, rocks, and trees. Shrines that were built to worship the gods housed statues representing deities and their accompanying divine treasures. These statues and treasures have been carefully preserved at Shinto shrines, places revered as sacred. This exhibition, on the occasion of the 62nd grand relocation of the Ise Jingu shrine, will be held with the full cooperation of Jinja Honcho (Association of Shinto Shrines) and shrines across Japan, presenting a rare opportunity for a comprehensive view of treasures and cultural heritage related to Shinto shrines and deities. Kami in brief -- When the English word God is translated into Japanese, it is generally represented by the kanji (Chinese character) 神 and pronounced kami. However, to avoid misunderstanding, it would be better to think of God, 神, and kami as three separate concepts. Shinto is Japan’s native religion. It developed in prehistoric times on the Japanese islands, and it is deeply etched in the minds and hearts of the Japanese people. Because of its close association with the land’s geography and history, Shinto is very nearly synonymous with the Japanese character. It has both shaped and been shaped by all of Japanese culture. Traditionally followers of Asian religions are inclusive and tolerant of other faiths; thus people may practice more than one religious tradition at the same time. They see no inconsistency in being both Shinto and something else—usually Buddhist. Of the 128 million Japanese, according to the statistics of the Agency for Cultural Affairs for 2006, 107 million identify themselves as Shinto and 89 million identify themselves as Buddhist. In effect, then, every Japanese person is religious and the vast majority may be considered in some fashion to be followers of Shintoism. Of the others, many belong to the “New Religions,“ or the religious movements that have emerged since the 19th century, and the remainder include Christians (3 million), Muslims (120,000), and Jews (2,000). Shinto has been closely associated with Buddhism for centuries, even sharing its temples and rituals. The Japanese have a saying, “Born Shinto, die Buddhist,” which indicates their dual reliance on these two traditions at different points in their lives. in our Shinto facebook group.